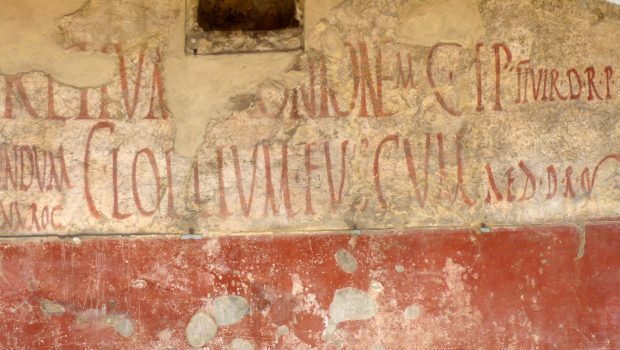 This week’s list of data news highlights covers February 17-23, 2018, and includes articles about using AI to predict heart disease from retinal scans and digitizing ancient graffiti in Pompeii and Herculaneum. Google and its e-health subsidiary Verily have worked out how to assess a person’s risk of heart disease by using machine learning to analyze scans of the back of the eye. The technique is about as accurate as existing methods, but it is cheaper and faster than a blood test. Fathom Computing, a startup that builds computers that process data using pulses of light instead of electricity, has successfully used an optical computer to train an AI algorithm to recognize handwritten numbers with 90 percent accuracy. The project is a breakthrough because it proves optical computers can be used to train AI. AI development currently depends on expensive silicon-based electronic graphics chips, the continual improvement of which may grind to a halt as scientists struggle to make transistors any smaller. Optical computing may provide a means of continuing to improve processing power long into the future. The Pentagon has announced a competition to develop machine learning tools that can analyze high-resolution satellite images of Earth in order to detect details relevant to humanitarian aid work, such as damaged buildings, utility trucks, and fishing boats. The xView Detection Challenge will launch next month. Researchers at the University of Washington in Seattle created an artificial neural network that mimics how moths learn to recognize odors. The researchers hope that replicating the relatively simple olfactory system of moths may provide insights into how machine learning systems could learn more from smaller amounts of data. Boston-based clothing company Ministry of Supply is developing a heated jacket that uses sensors to monitor heat and movement, and regulates the temperature using machine learning. Ministry of Supply hopes the data produced by customers wearing the jacket when it goes on sale to the public will yield information about people’s preferences and help the company make better products in the future. Researchers have published a study that suggests it may be possible to use machine learning to predict the onset of bronchiolitis obliterans syndrome, better known as “popcorn lung,” in patients receiving lung transplants. The researchers found that 23 parameters in computed tomography (CT) scans of patients who had recently received lung transplants could distinguish those who went on to develop the disease from those who did not. Furthermore, they found that using machine learning made it possible to predict popcorn lung with 85 percent accuracy using just 3 parameters from the CT scans. The Ancient Graffiti Project is a crowdfunded effort to create digital records of ancient graffiti from Pompeii and Herculaneum. Both cities were submerged in lava when Mount Vesuvius erupted in the year 79 CE, which preserved the remains of buildings, furniture, people, and even food. From the early 19th century onwards, archaeologists also discovered thousands of drawings and messages that the cities’ former inhabitants left on walls using charcoal. The team behind the Ancient Graffiti Project wants to record this ancient graffiti digitally, along with images and translations of the Latin and Greek. Researchers in Waterford, Ireland have found a new way to reliably store data in DNA and retrieve it. Scientists have already shown that DNA can store huge amounts of information—up to one zettabyte in a single gram. To put that figure in context, humanity currently produces about 16 zettabytes per year. The new method allows data to be stored in DNA for longer periods than previously possible, raising the possibility of DNA one day becoming a viable option for data storage, which could drastically cut the space and energy demands of current storage methods as the world continues to produce and store ever more data. Mathematicians at the U.S. Department of Energy’s Lawrence Berkeley National Laboratory have developed a new approach to machine learning that trains algorithms to recognize images using far fewer samples than usual. Besides making AI learn faster, there is hope that the technique will enable researchers to use the same image recognition algorithm across a wider variety of domains. Robotics company Boston Dynamics, whose robot videos often go viral on social media, has released footage of a robot dog persistently trying to open and walk through it while a hockey-stick wielding human tries to foil its plans. Teaching the robot to persist in this manner allows it to reliably carry out tasks in real-world environments where unexpected challenges might confound a machine trained in pure laboratory conditions.